TORONTO, July 30, 2015—In the wake of the news that esteemed Canadian NGO Canadian Hunger Foundation (CHF) is ceasing operations as of July 31, 2015, CFTC is announcing that it has been selected by CHF to take over responsibility for two development initiatives currently underway: the Resilient and Sustainable Livelihoods Transformation (RESULT) Project in northern Ghana; and Market-Led Improved Livelihoods in Eastern Amhara Region (MILEAR) in Ethiopia. These projects, initiated by CHF with generous funding from the Government of Canada through the Department of Foreign Affairs, Trade & Development (DFATD), are supporting 275,000 people to achieve greater food security, improved agricultural production, better nutrition and greater income in some of northern Ghana’s and Ethiopia’s most impoverished communities. 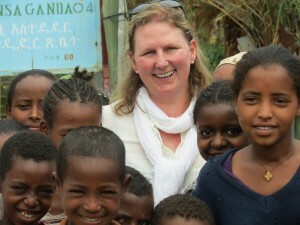 CFTC President & CEO Debra D. Kerby in Ethiopia. “Canadian Feed The Children is honoured to have been selected by CHF to assume responsibility for RESULT and MILEAR. Our goal is to seamlessly continue the exceptional work that CHF has pioneered, and ensure that the children, women and men in the project communities continue to benefit,” said Debra D. Kerby, President & CEO of Canadian Feed The Children. “Like CHF, CFTC applies the same best practice, community-led development principles to ensure that these farm families can create sustainable, positive change for themselves and their children,” she added. With more than 25 years of experience in both of these locations on comparable projects, CFTC is well positioned to take on these projects and further their goals. “In the past several years, CFTC has been recognized for its good governance and financial accountability. The agency was one of the earliest organizations to achieve Imagine Canada Standards accreditation (in 2013), and earlier this year we earned Exemplar Status from the Voluntary Sector Reporting Awards for transparency in financial reporting conferred by the Queen’s School of Business Centre for Governance and Grant Thornton LLP. We believe these strengths are key factors in being selected to assume responsibility for RESULT and MILEAR, and will serve the projects and their supporters well going forward,” said David Pell, chair of Canadian Feed The Children’s board of directors. “We are deeply grateful to DFATD for their ongoing support for these important projects and for putting their trust in us to achieve continued impact. We are passionate about our role as a conduit for all Canadians to contribute to increased empowerment in these vulnerable communities, and an environment where every child can survive and thrive,” Debra Kerby said. These projects are made possible with generous funding from the Government of Canada through the Department of Foreign Affairs, Trade & Development.